Panavision: Diverse Practices, Common Views. Schools to the Park 2013, Encounters with artists. Fundación Pablo Atchugarry’s Educational Program for Primary Public Schools of Maldonado. Pabellón María Cristina Bonomi y Pedro Atchugarry, Room I.
Uruguayan exhibition at the XIII Venice Architectural Biennal, 2012. Pabellón María Cristina Bonomi y Pedro Atchugarry. Room II. Exhibition of prints in several techniques: Silkscreen, Photoengraving, Xylography on diifferent mediums: paper, fabric and cardboard. Pabellón María Cristina Bonomi y Pedro Atchugarry. Room III. Exhibition of Mixed Media works and Watercolor, Tempera and Ink drawings. Schools to the Park 2013, Encounters with artists. Hugo López Chirico Auditorium and Miguel Angel Battegazzore Educational Room. Exhibition of works done by Primary Public School children of Maldonado, in workshops given by invited artists. The exhibition consists of works done in several disciplines such as: Painting, Silkscreen, Stencil, Architecture, Photography, Stop-Motion, Musical Production in XO Laptop, Dancing, Acting, Singing. 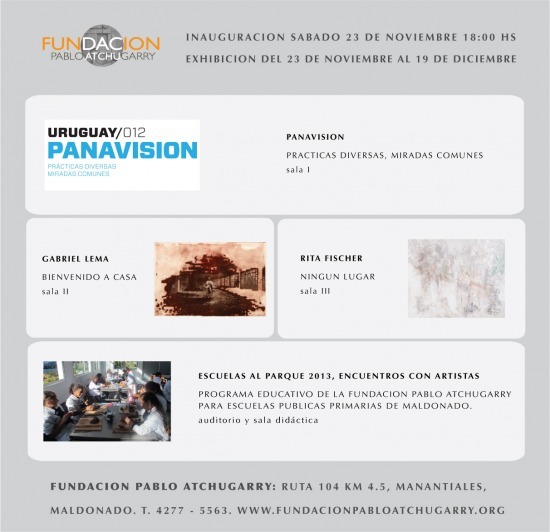 MEC (Ministry of Education and Culture) 2012 Prize of Support to the Strengthening of Artistical Institutions of Uruguay.